The Bureau of Prisons contacted me today, assigning me a prison number and a new address: for the next 90 days, beginning tomorrow, I’ll live at FMC Lexington, in the satellite prison camp for women, adjacent to Lexington’s federal medical center for men. Very early tomorrow morning, Buddy Bell, Cassandra Dixon, and Paco and Silver, two house guests whom we first met in protests on South Korea’s Jeju Island, will travel with me to Kentucky and deliver me to the satellite women’s prison outside the Federal Medical Center for men. 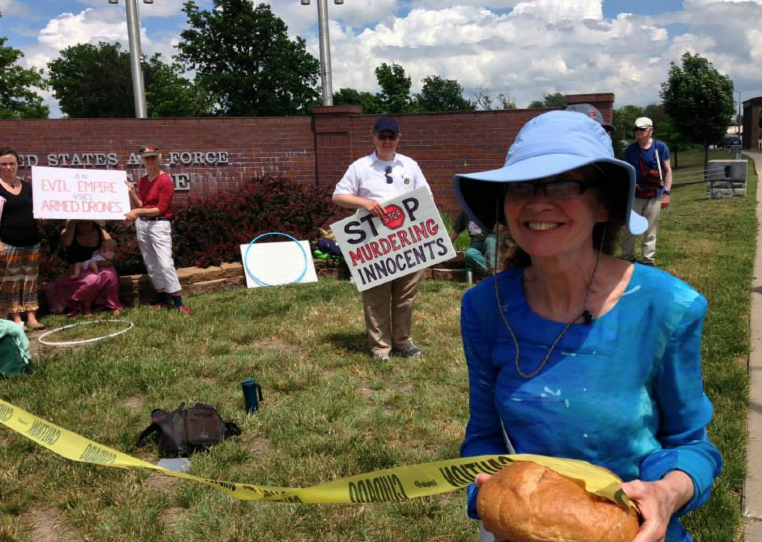 In December, 2014, Judge Matt Whitworth sentenced me to three months in federal prison after Georgia Walker and I had attempted to deliver a loaf of bread and a letter to the commander of Whiteman Air Force base, asking him to stop his troops from piloting lethal drone flights over Afghanistan from within the base. Judge Whitworth allowed me over a month to surrender myself to prison; but whether you are a soldier or a civilian, a target or an unlucky bystander, you can’t surrender to a drone. It’s good to laugh and feel camaraderie before heading into prison. For someone like me, very nearly saturated in “white privilege” through much of this arrest, trial, and sentencing process, 90% (or more) of my experience will likely depend on attitude. But, for many of the people I’ll meet in prison, an initial arrest very likely began with something like a “night raid” staged in Iraq or Afghanistan, complete with armed police surrounding and bursting into their home to remove them from children and families, often with helicopters overhead, sequestering them in a county jail, often with very little oversight to assure that guards and wardens treat them fairly. Some prisoners will not have had a chance to see their children before being shipped clear across the country. Some will not have been given adequate medical care as they adjust to life in prison, possibly going without prescribed medicines and often traumatized by the sudden dissolution of ties with family and community. Some will not have had the means to hire a lawyer and may not have learned much about their case from an overworked public defender. In the U.S., the criminal justice system disproportionately incarcerates people of color for petty offences. Many take plea bargains under threat of excessive, punitive sentences. If I were a young black male, the U.S. penal system quite likely would not have allowed me to turn myself in to a federal prison camp. I’ll be incarcerated in a satellite camp outside a medical facility where I expect the wards are crowded with geriatric patients. How bleak and unnecessary it is to confine people for decades. My friend Brian Terrell, who was incarcerated in Yankton, South Dakota for six months after crossing the line at Whiteman AFB, told me that while in prison he saw signs on the walls recruiting prisoners to train for medically assisting geriatric male prisoners. I shudder to think of our culture’s pervading callousness, pointlessly consigning so many aged people to languish in prison. I will be free in three months, but our collective future is most assuredly shackled to a wrongheaded criminal justice system. I hope this compulsively vengeful and diseased criminal justice system will change during my lifetime. And I hope that my short sojourn inside Lexington’s prison walls will help me better understand and perhaps help shed some small light on the systems that affect other people trapped there. During recent visits with concerned communities focused on drone warfare, many have helped me see a connection between the drone killings across Central Asia and the Middle East and the casual executions and incarceration of young black males in our own country. Our young friends wish to provide a better life for the very children whose only other ways off the streets may well include joining the Taliban, criminal gangs, or some other militia. Meanwhile, the United States’ vengeful stance as a nation, concerned with protecting its wealth and status at all costs and its safety above all considerations of equity or reason, destroys the lives of the impoverished at home as it destroys those abroad. 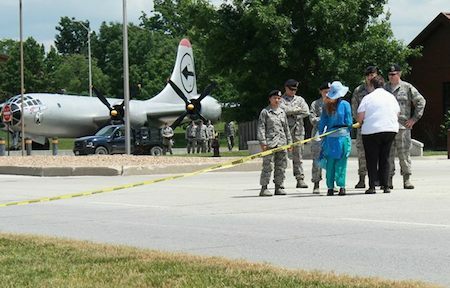 The “Black Lives Matter” protests need our support, as do the March 4-6 protests to “Shut Down Creech” Air Force Base. Our friends in the Afghan Peace Volunteers will continue to do vital work for peace and solidarity, in Kabul, that needs our support. It’s encouraging to know that thousands upon thousands of committed people seek and find work to make our world less like a prison for our neighbors and ourselves.